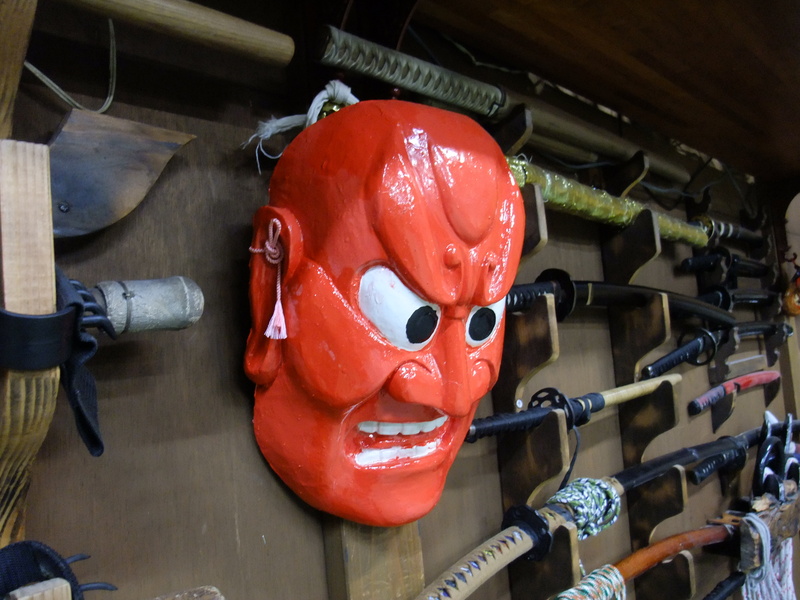 Since the big earthquake in March there is a new mask under the Shinden at the hombu dôjô. Sensei painted it in a bright orange color as this is the color for protection in Shintoism. The Torii (鳥居) at the entrance of the Shintô temples is often painted with this bright orange to indicate that the area is protected. Sensei explained Sunday during his class that he put it there to protect the dôjô. I like this mix of tradition and modernity always present in Japan. On the budô side, today was a tough day for all of us as we had three classes. I gave a class at 11am, Nagato sensei at 2:30pm and Noguchi sensei at 7pm. For those coming soon to train in Japan, please note that Hatsumi sensei and Noguchi sensei are teaching now their night classes at 7pm instead of 8pm. Please also note that the Budôkan being reserved for the refugees of the tsunami, all classes by sensei are held at the hombu dôjô until further notice. I had the feeling today that a little less people than the other days were training so we had more space to train correctly. The jûgodan are allowed to teach at the hombu and I have been doing it for many years now but somehow I always feel honored to be allowed to teach at the hombu dôjô and it is always a very nice experience. I taught today’s class in Spanish as only three participants were not coming from south or central America. All the other students were from Christian Petrocello’s group and coming from Argentina, Mexico, Ecuador and Chili. 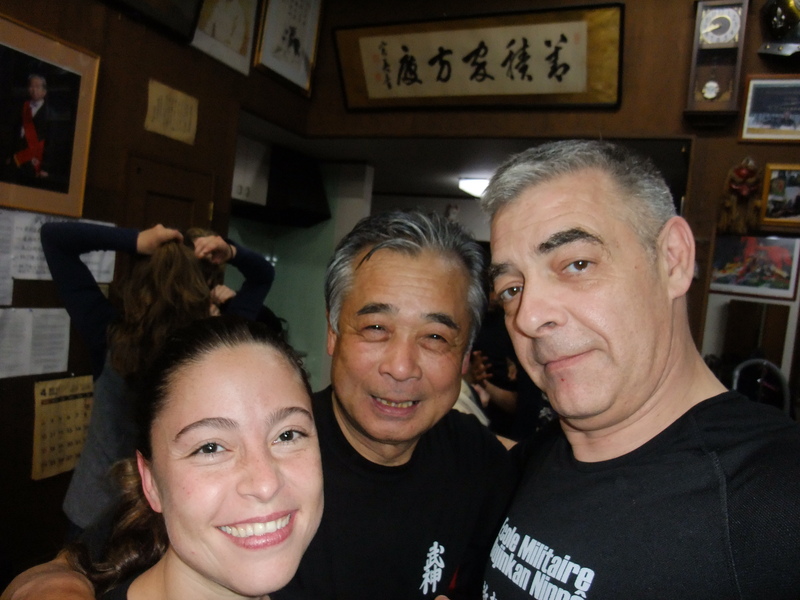 If you had a chance to visit their dôjô in their country don’t miss this opportunity they are really good people to train with, with a good heart, and committed to the bujinkan. I guess that the charisma and technical level of Christian created this feeling amongst his students. Thank you Christian. The first part of my class was dedicated to taijutsu and we reviewed the differences between kosshi (骨子), koppô (骨法) and ninpô (忍法) as well as the kamae of each level of the gyokko ryû: ten ryaku uchu gassho no kamae, fûten goshin gassho no kamae, hanno bonitsu no kamae, ending all in tenchi inyo no kamae. 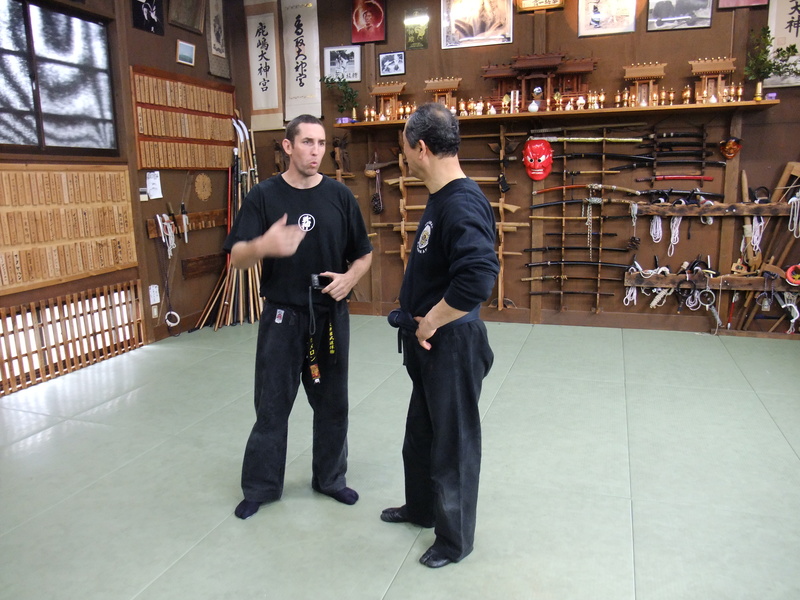 As these kamae are linked individually to each one of the three levels of the school, they give a better understanding of the school syllabus and progression. After a short break we reviewed the sword techniques demonstrated by Hatsumi sensei in his previous classes last week. They were mainly based on the variations of tsuki komi from the kukishin ryû and use the whole body (karada – 身体). Then at Nagato sensei’s class we did many variations on oni kudaki with a hanpa approach in which uke is trapped by his own reactions. 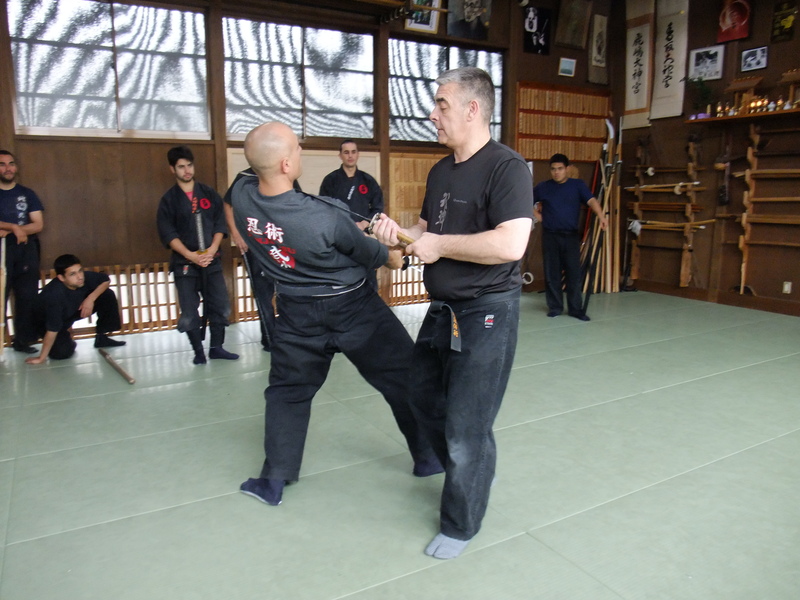 The control on uke’s body is given by the distance created by the footwork and the use of the body (karada – 身体). Once again Nagato sensei insisted in not putting any strength and letting uke do the job for us. Piling up uke on his lower back and using his body natural reactions to trap him is always difficult but the many angles and distances demonstrated by him were so clear that many could actually do them at the of the class. Lesson: keep your body balanced and uke in a weak posture. Use no strength so that uke is not able to build up his reactions on it. Let him fall by his own body tensions. It reminded me of a sentence of Hatsumi sensei in a recent trip: “don’t use strength, uke is already using it!”. Nice class as alaways. After a two hour break and some food, we began training with Noguchi sensei. 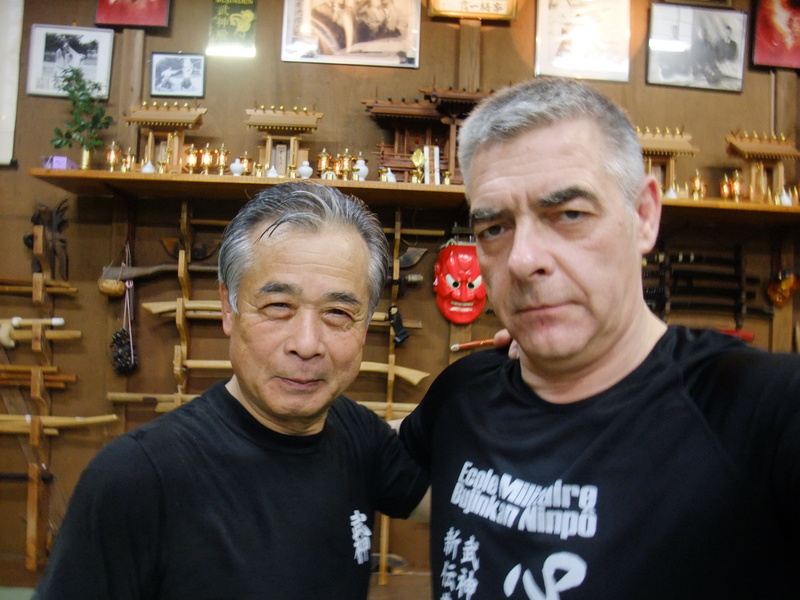 When you come and train in Japan, you feel very tired after a few days but when you attend Noguchi sensei’s class his energy is so communicative that you feel more relaxed after it. Having said that, you still don’t get the “hows” and the “whys” but you feel richer after the class. Today Noguchi sensei did some koto ryû koppô jutsu variations around the first techniques of the school in his inimitable manner. His body flow is always amazing and even you think that you have it, it is nearly impossible to reproduce correctly. His energy fills the dôjô so totally his 90 minute class is over before you know it. We used the koto ryû particular footwork known as jûji aruki with every henka (変化), this was the main lesson of tonight’s class. Hatsumi sensei said in December that yoko aruki (gyokko ryû) is crossing the feet, toes heading in the same directions; where jûji aruki (koto ryû) is with your feet at a perpendicular direction. Again Noguchi sensei showed us that the use of strength was not necessary as the balance of uke is taken by our sole footwork and by the precise use of the body. As usual he did many henka using the spine and the neck and a few ones where he didn’t even use the hands. A rejuvenating class indeed. Tomorrow Friday we have two more classes: one with Noguchi sensei at 2pm where we will be reviewing the jin ryaku no maki (from the tenchijin) and another one with Hatsumi sensei at 7pm. During Nagato sensei’s class he reminded us of the importance of asobi (遊び), the have the playfulness of a kid while training. In August Hatsumi sensei precised that playfulness should not lower our level of awareness, though. Being « seriously playful » is what is expected from us during training. This also applies to what is happening here in Japan outside of the dôjô. Thank you very much my friend Arnaud for your good news about the training sessions. My best regards to you, Noguchi and Sôke. Really enjoying your blog! Thanks for sharing.